Peak Roofing of York are approved installers for Roof It All GRP roofing systems, installing flat roofs in Leeds, flat roofs in York and flat roofs in Wakefield and across Yorkshire. Fibreglass has been used in the manufacture of boats and cars for many years and has also been used as a roofing material since the 1960s with many of these original roofs still structurally sound. 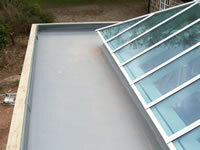 A typical GRP Fibreglass Flat Roof consists of a layer of heavy-duty fibreglass matting sandwiched between two layers of premium grade resin with a further layer of coloured resin topcoat to give a smooth finish to your Leeds roofing, York roofing or Wakefield roofing. 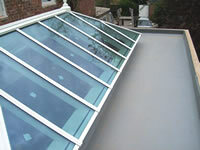 The materials are fully bonded to the roof deck and can laid to any shape or formed around any detail such as pipework or roof windows. 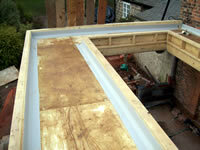 The materials are applied cold so there is no risk of fire or heat damage to your flat roofing. The topcoat is available in a variety of colours and the smooth finish does not attract moss like felt roofs, therefore ensuring your flat roof will look good for years to come whether it's a busy city center Leeds flat roof, and historical flat roof in York or a flat roof in Wakefield. A typical garage or similar sized roof can usually be installed in one day and when the overall lifespan of the roof is taken into account GRP Fibreglass Flat Roofing really is the only option for Leeds flat roofing, York flat roofing or Wakefield flat roofing.